The El Paso Municipal Police Officers’ Association sadly announces the passing of retired Officer George H. Garza #822. He passed away on May 3, 2017 at the young age of 56. (Ret.) Officer Garza served the El Paso community as a peace officer for 29+ years, most of it spent working out of the Mission Valley Regional Command Center. A Juárez police officer was killed and another was wounded in an attack outside a convenience store Wednesday morning just west of downtown, officials said. 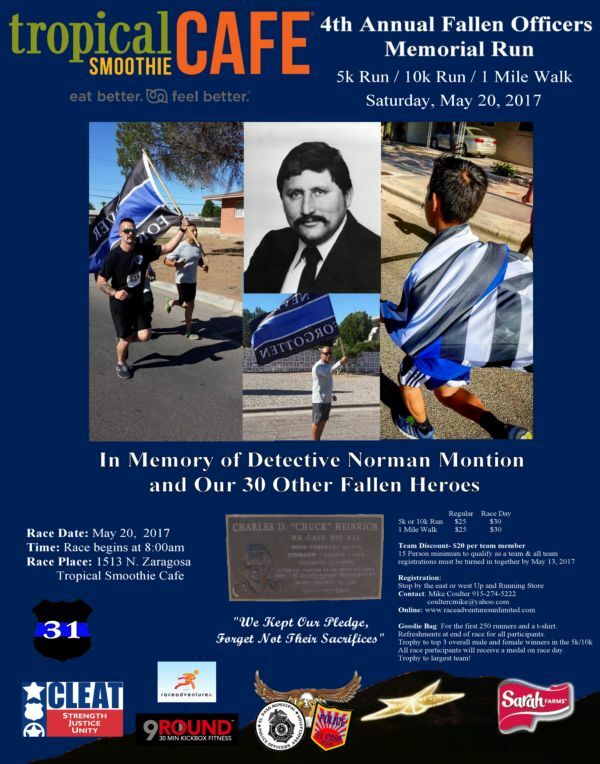 The 4th Annual EPMPOA Fallen Officers Memorial Run, this year sponsored by Tropical Smoothie Cafe, will take place on Saturday, May 20, 2017. There will be a 1 Mile walk, a 5K run and a 10K run. The race will start at 1513 N. Zaragoza Rd. For additional information, or to register, visit www.raceadventuresunlimited.com or contact Mike Coulter at (915) 274-5222. Signed Tom Brady Super Bowl LI Helmet Fundraiser Constantine Salce Constantine is the 9 year old son of Correctional Officer Dominic Salce and his wife Lu. Constantine was born with the genetic disorder Spinal Muscular Atrophy (SMA). SMA is a genetic disease affecting the part of the nervous system that controls voluntary muscle movement. Members, The next General Membership meeting of the St. Louis Police Officers' Association is scheduled for this Wednesday, April 26, 2017 at 7pm. Acting Police Commissioner Lt Col O’Toole will address those in attendance. 04/24/17 - Colorado State Lodge F.O.P. If you are Colorado Law Enforcement and are planning on being in Washington DC during "National Police Week 2017".....You are all invited. FREE cardiovascular screening by Deborah Heart and Lung. An El Paso police officer shot a man who allegedly took out a handgun during a traffic stop late Wednesday in the Northeast, a police spokesman said. The wounded man was taken to University Medical Center of El Paso. His condition was unknown. The shooting occurred soon after 11:40 p.m.
04/19/17 - Colorado State Lodge F.O.P. Today, 04/19/17 the Colorado FOP's PTSD Workers Comp bill (HB 17-1229) passed the full Colorado Senate unamended on 3rd and final reading. The bill is on its way to the Governor for signing. We are working with the Governor's office for a special signing. By Paul Kelly, President, San Jose POA In the past, I don’t remember a lot of “Good Samaritan” stories in which law enforcement officers were helped or saved by citizens doing the right thing. But I am happy and grateful to say this year seems to be different. Site under reconstruction. Please check back for new and improved site after May Day. 04/13/17 - Colorado State Lodge F.O.P. Yesterday, 04/12/17 the Colorado FOP's PTSD Workers Comp bill (HB 17-1229) passed the Senate Business, Labor & Technology Committee unamended. The committee vote (6 yes and 1 no) was overwhelmingly in favor of moving this very important bill forward. The name of an El Paso police motorcycle officer killed while escorting a funeral will be added to the Texas Peace Officers' Memorial next month after initially being excluded. Officer Adrian Arellano, 39, was killed when his police motorcycle was hit by a car while working off-duty escorting a funeral procession on March 18, 2015. 04/08/17 - Colorado State Lodge F.O.P. On Tuesday, March 28, 2017 the National Executive Board was invited to meet with President Donald J Trump. After the meeting was scheduled we learned that Vice President Spence and Attorney General Sessions requested to be in the meeting with us as well. CALL YOUR LEGISLATORS TODAY TO URGE THEM TO SUPPORT COLORADO’S FIRST RESPONDERS. A local law enforcement leader is dead after being shot behind the Baytown courthouse about 7 a.m. Monday, police said. The suspected shooter remains at large, leading to a lockdown in the area. Clint Greenwood, assistant chief deputy with the Harris County Precinct 3 Constable's Office, was arriving to work when someone opened fire on him. SLPOA ENDORSEMENTS Proposition 1 – YES Proposition 2 – YES Proposition A – NO Proposition B – NO Proposition C – NO Mayor – Lyda Krewson Comptroller – Darlene Green Ald. Ward 5 – Tammika Hubbard Ald. Ward 7 – Jack Coatar Ald. Ward 11 – Sarah Wood Martin Ald. Ward 13 – Beth Murphy Ald. MEDIA RELEASE For Comments Contact: Jeff Roorda at 314.420.3861 St. Louis Police Officers Association Endorses Soccer Proposal St. Louis, Missouri (March 31, 2017) – The St. Louis Police Officers Association (SLPOA) formally announced today their endorsement of Proposition 1 & 2 on Tuesday's ballot in St. Louis City. 03/28/17 - Fraternal Order of Police of Ohio, Inc.
FOR IMMEDIATE RELEASE MARCH 22, 2017 WE ARE OHIO APPLAUDS MANSFIELD FOR OPPOSING 'RIGHT TO WORK' MANSFIELD, Ohio – Statewide pro-worker organization We Are Ohio applauded Mansfield City Council for unanimously approving a resolution opposing 'Right to Work’ on Tuesday. 03/27/17 - Colorado State Lodge F.O.P. A bill that sailed through an initial vote in the House Friday would assure that PTSD is a condition that qualifies for worker’s compensation insurance. House Bill 1229 is aimed at but doesn’t specify police officers and other first responders. But it describes what usually only they do that could cause post traumatic stress disorder. At three years old, Kona has experienced enough pain to last a lifetime. The Shar-pei mix was found on the streets of Juarez, Mexico after being hit by a car. After losing the use of his two front legs, the dog had been dragging himself along so long that bone was exposed. His injuries were so far gone that a vet made the decision to amputate Kona's front legs. The HPSA has endorsed Carrie Cox for Henderson City Council Ward III. Greetings! What a couple of months we've had on the PAC committee! This election cycle has kept us very busy with interviews and vetting candidates for the upcoming May Uniform Election. The PAC Committee, in conjunction with the Coalition of Public Safety, held interviews on Friday March 3rd and Friday March 10th with several candidates seeking our endorsement. 03/19/17 - Colorado State Lodge F.O.P. MEDIA RELEASE For Comments Contact: Jeff Roorda at 314.420.3861 St. Louis Police Officers Association Opposes Misleading Ballot Initiative St. Louis, Missouri (March 13, 2017) – The St. Responding to the shooting deaths of five Dallas police officers last July, the Texas Senate on Monday unanimously approved five pieces of legislation, including efforts to provide better bulletproof vests and give financial help to the families of officers killed on duty. For many who knew police Officer David Ortiz it's almost unbelievable a year has gone by since he died. For Ortiz's family the death is still fresh in their hearts. 03/11/17 - Colorado State Lodge F.O.P. We are inviting all brothers and sisters in blue, and friends of law enforcement who can attend, to be at Craig to welcome and show support for Officer Brian Arterburn and his wife. 03/07/17 - Colorado State Lodge F.O.P. Please be at Craig Hospital tomorrow, March 8th at Noon, to help us send off Officer Kevin Holtry (Boise PD). Please drop by to wish him well as he returns to Boise to start the next chapter of his life. Please share! "He's a warrior," said Dr. Mark Johansen, the hospital's medical director. Please join us on June 19, 2017 at the NHPA Golf Tournament & Annual Meeting at the beautiful Passaconaway Country Club in Litchfield NH. Registration at 7:00am with a shotgun start at 8:00am. Voting for the NHPA Board will be open from 7:00am to 12:00pm. Results will be announced during the Annual Meeting. The Annual St. Patrick’s Day Parade in St. Louis will take place on Saturday, March 11, 2017 and will be dedicated to the city of St. Louis’ First Responders. Leading the 48th annual parade will be parade founder and St. Louis Irish Consul Joseph McGlynn, Jr.
El Paso Police Chief Greg Allen says his department isn’t interested in taking on federal immigration enforcement duties. That’s what he told about 100 people at last Wednesday’s Central Business Association luncheon. LAPD Officer James Zboravan was two months and eight days out of the police academy when he faced a barrage of machine-gun fire, shot and wounded a bank robber and dove across unarmored officers to shield them with his bulletproof vest. He was shot four times before leaping through an exploding glass doorway. “There was no time to be scared. It’s not a macho thing. The El Paso Municipal Police Officers’ Association sadly announces the passing of retired Detective Alfredo "Freddie" Bonilla #52. He passed away at the age of 80. (Ret.) Detective Bonilla served the El Paso community as a peace officer for many years. 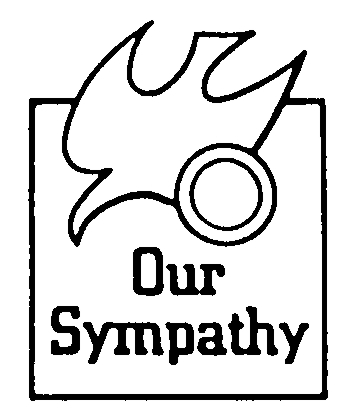 Funeral Services for (Ret. 02/17/17 - Colorado State Lodge F.O.P. On Wednesday, February 22, 2017 the Denver Sheriffs FOP Lodge 27 is joining with groups representing the Denver Community in speaking out over serious concerns involving the Denver Jail and safety issues. El Paso officials gathered Thursday to discuss how the city will grow within the next 3 years. Public safety made its way to the front of discussions. City council, the mayor and the city manager gathered with the heads of all city departments to break down the 20 key projects and goals it has for the next three years. A suspect wanted in a federal manhunt opened fire on law enforcement Tuesday. According to MySanAntonio.com, local and state law enforcement joined a federal manhunt for the suspect and attempted to take the man into custody in a restaurant parking lot. The suspect resisted and opened fire on police. One bullet went through a glass pane of the restaurant, but no one was injured. The El Paso Municipal Police Officers Association does not back officers who are facing criminal charges, with minor exceptions. ABC-7 spoke with union President Sgt. Ron Martin after two El Paso police officers were charged with sexual assault. 02/08/17 - Colorado State Lodge F.O.P. The FOP Foundation has organized this event to help raise funds to assist one of our brothers in dire need of financial support. Deputy Sheriff Michael "Law-Dawg" Nester, a member of the Fraternal Order of Police, has been diagnosed with lung cancer and is currently undergoing aggressive chemo and radiation treatments to battle this horrific disease. Help is needed to offset the growing financial burden. For most people, cortisol, the vital hormone that controls stress, increases when they wake up. It’s the body’s way of preparing us for the day.